The Reuters Institute for the Study of Journalism in partnership with Google are delighted to announce the appointment of Professor Lucy Küng as the first Google Digital News Senior Research Fellow. Lucy Küng is a professor and expert on strategy, innovation and leadership with particular emphasis on managing technology shifts. She has focused on these issues as Professor of Media Innovation (University of Oslo), as Visiting Fellow at the Reuters Institute, as non-executive Board Member of the Swiss public service broadcaster, SRG, and of Vizrt, a media technology specialist, and as advisor to media organisations. She holds a PhD and Habilitation from the University of St Gallen, Switzerland and an MBA from City University London/Ashridge. She is the author of numerous books and cases including ‘Innovators in Digital News’ (2015), ‘Strategic Management in the Media’ (winner of the AEMJM Media Management Book Award), ‘Inside the BBC and CNN – Managing Media Organizations’, and ‘When Innovation Fails to Disrupt: The Case of BBC News Online’. Lucy Küng is based in Zürich and Oxford. 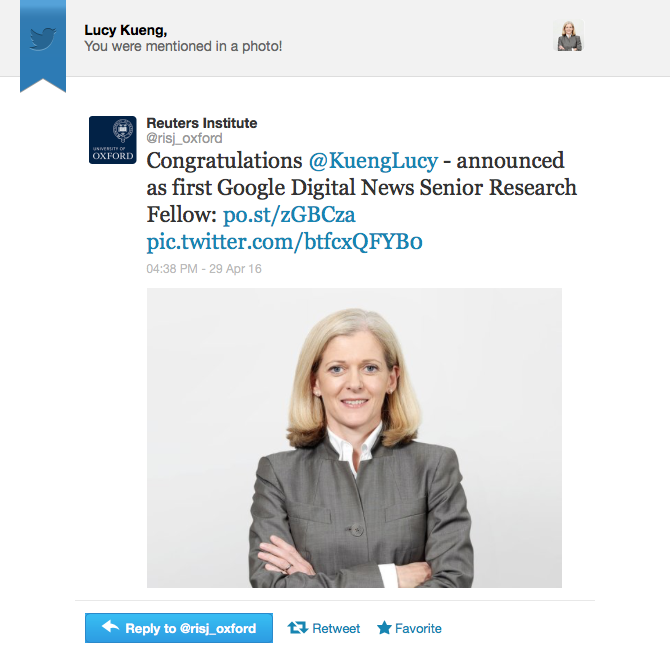 As the first Google Digital News Senior Visiting Research Fellow, Professor Lucy Küng’s project “Going digital – changing the narrative and understanding the path to growth” will examine the organisational approaches that will allow media institutions to master the challenges of the new strategic context, and seize the growth potential that digital disruption presents. Her research will seek to create an organisational roadmap for the media sector. The Fellowship will commence from October 2016 and we look forward to working with Professor Küng as she undertakes this fascinating project.